President Donald Trump speaks at Granite City Works warehouse on Thursday. His audience included some of the 800 steel workers who’ve been hired at the Granite City Works steel mill, which is being reopened by US Steel. “If you don’t have steel you don’t have a country,’’ Trump said, emphasizing his belief that resurrecting the nation’s steel mills is a national security issue. His supportive audience included William Mullen, who has been working at the Granite City mill for about two weeks. Mullen said he left another manufacturing job. Trump asserted that untold numbers of American steel workers have lost “their jobs, their hopes and their way of life” over the past decades because of government missteps. US Steel President David Burritt was among the speakers who called for Trump to stand firm with his tariffs imposed on imported steel and aluminum, saying that was the best way to help American workers. “It does indeed feel like a renaissance for US Steel,’’ Burritt said. Attendees listen as President Donald Trump speaks at a Granite City Works warehouse on Thursday. But Trump’s tariffs have particularly hurt the nation’s agricultural industry, which has been the target of retaliation by foreign countries hurt by them. That’s why the administration this week announced $12 billion in farm aid. The University of Missouri’s Commercial Agriculture Program released a study Thursday concluding Trump’s trade policies has cost the state millions of dollars in economic activity. Almost a third of Missouri's annual soybean crop had been destined for China, but those sales now are uncertain. The study said the state's soybean prices have dropped nearly 20 percent this summer. Trump said Thursday that he cares for American farmers, and that he’s optimistic his trade deals will reward them. Sam Stratemeyer, a soybean farmer and businessman from Metropolis, Illinois, trusts Trump to resolve the tariff stand-off. Stratemeyer was among several audience members who noted that soybean prices have shot up just since the president’s meeting Wednesday with an official of the European Union who indicated that Europe was ready to purchase more American farm products. “He’s not going to preside over a declining America,” Stratemeyer said. 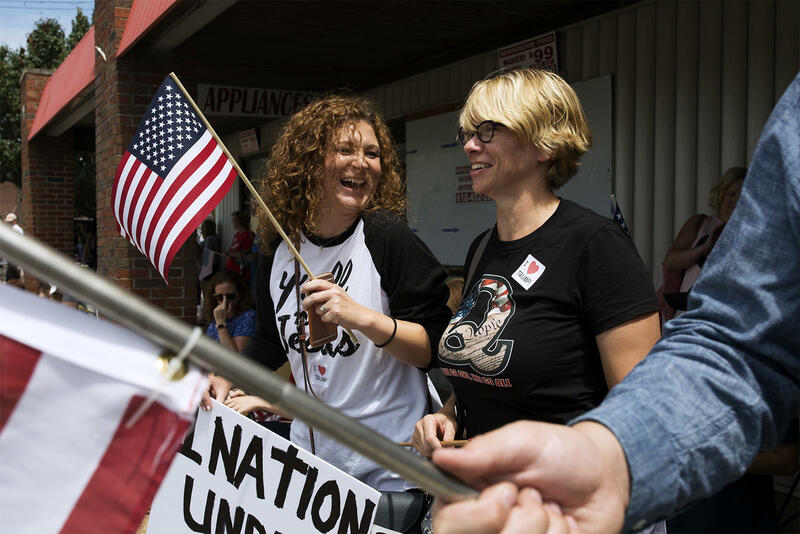 Allison Vanders and Shannon Blackorby joined other Trump supporters in downtown Granite City to wait for President Donald Trump's motorcade to pass. U.S. Rep. Rodney Davis, a Republican from Taylorville, Illinois., was among the GOP elected officials at the event. Davis praised the president for tackling the complicated trade issues. Davis added that he shared farmers’ concerns about the tariffs, but he’s confident the matter will be solved. “We don’t want the $12 billion in aid to even be used,” the congressman said. 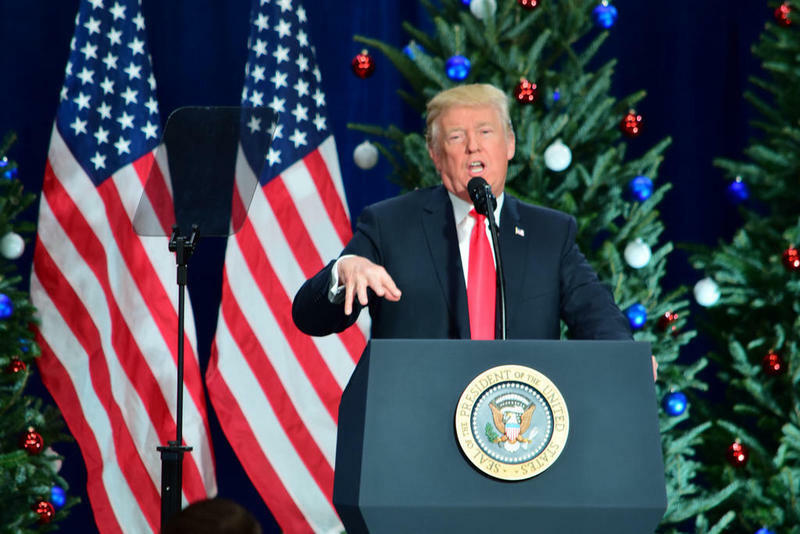 The president meshed his remarks on various issues, from Russia and immigration to his 2016 election, with periodic barbs against the news media. But Trump said he was succeeding because the public was behind him. "With your help, we are lifting up workers all across our land," he said.